The Dubliner meets Hawaiian Max Holloway on 17 August but is only thinking about his own performance. 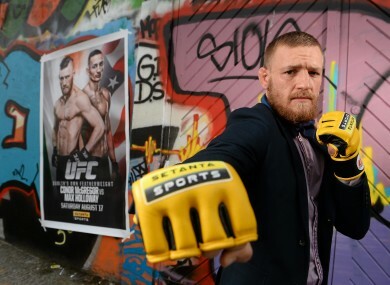 McGregor posing at the Setanta Sports media event yesterday. IRISH UFC FIGHTER Conor McGregor is focusing on his own gameplan and not his opponent ahead of the upcoming fight in Boston. The SBG featherweight takes on Hawaiian Max Holloway after an injury to Andy Ogle meant the Englishman was forced to pull out of the 17 August bout. It will be the 25-year-old’s second UFC appearance after defeat Marcus Brimage with a first round TKO in April and McGregor insists that he will prepare for this fight in the same way – by visualising his own moves and strikes. “I was supposed to be fighting more of a wrestler, a grinder,” McGregor told the media at a Setanta Sports media event in Dublin yesterday. “Now I’m fighting a Hawaiian who prefers to stand up. I see some good exchanges. I think he’ll give me more exchanges than the last opponent. But I think I’ll be too strong, too slick and will have too many moves in my locker. I think I could have him out of there by the end of the first round… maybe the second. I’m feeling confident. It’s going to be a fun night representing Ireland. “I don’t look too much at my opponent. For me, there is no opponent. I am the opponent. I don’t dwell on who the body is in front of me because it can change like that. McGregor, who recently spent time training in Las Vegas, is set for his US debut at TD Garden and will hope to have the crowd on his side with a strong Irish community in Boston. Over the past six months, he has become the poster boy of Irish MMA and isn’t fazed by the added pressure that brings. He also added that although he enjoys training in new environment as part of his contract, there would be no need to move away from home to further his career. “My training is good over here and I don’t need to move abroad. Don’t get me wrong, I will travel and vary my training. But even when we had a team which was only two or three strong, I always felt that these guys are the best. Email “'There is no opponent' - McGregor on Boston fight ”. Feedback on “'There is no opponent' - McGregor on Boston fight ”.